The McKenzie River Scenic Byway may leave you spellbound as you explore this timeless transition into Oregon’s Cascade Mountains. Nostalgia is alive along this byway; you feel it when you pass through two of Lane County’s 20 covered bridges: Goodpasture – at 165 feet, Oregon’s second longest – and Belknap Bridge, a river cross-over since 1890. 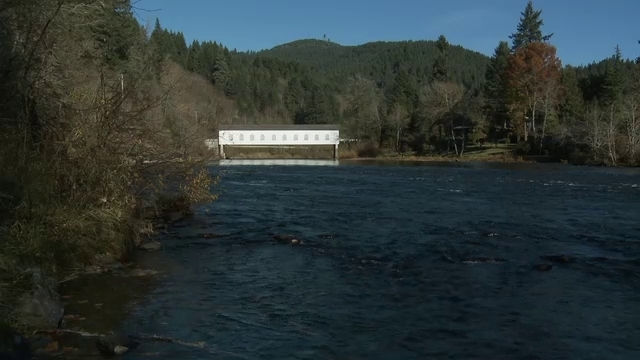 “The bridges were generally made of wood back in the 20s and 30s, but if you covered them the timbers would last twice or three times longer in Oregon’s wet weather,” said Trendler. 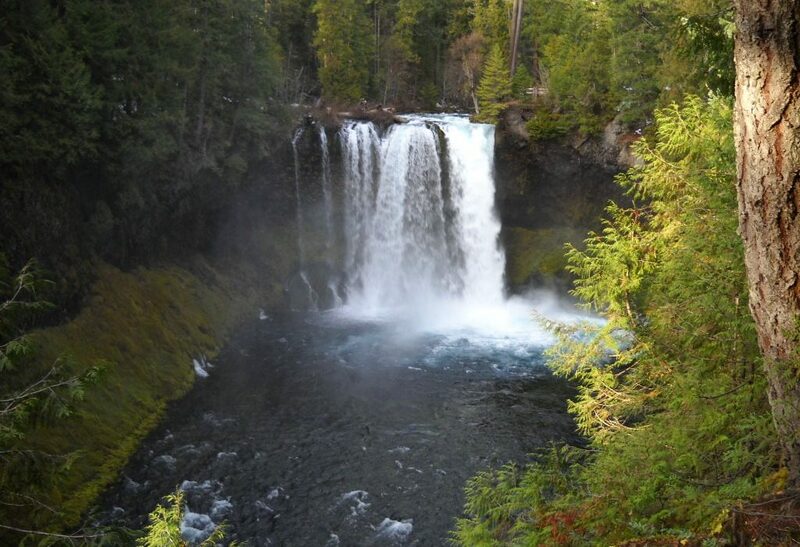 Wet may be what you’ll get when you reach the plunge pool world of Sahalie Falls and Koosah Falls. The trails to each are always open and easy to reach from the highway, and the falls are beautiful when surrounded by snowfall during the winter months — just keep in mind the parking lot is not plowed. Two hikers — photo pro Steve Terrill and Oregon newcomer Roy Nuesca — brought cameras and tripods to capture the sites along the 4-mile out-and-back trail to reach the Blue Pool. Each agreed that the McKenzie River provides an unmatched canvas to create lasting memories with camera and lens. 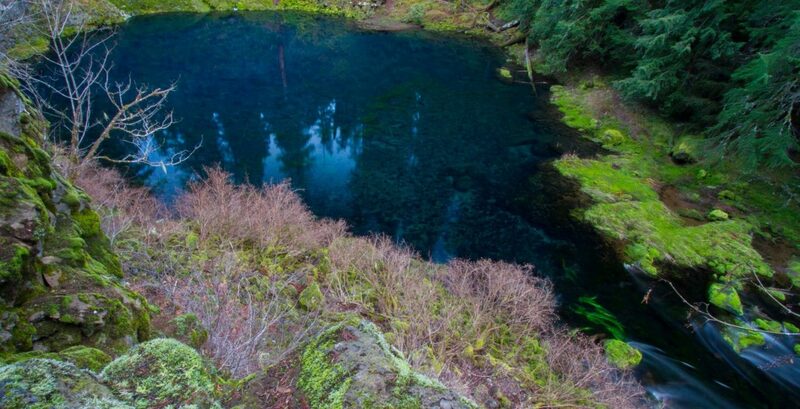 Blue Pool, also known as Tamolitch Pool, is where the McKenzie River seeps to the surface through underground lava fields that flowed across the landscape eons ago. You’ll be astounded by the color of the Blue Pool, so slow down and savor the Oregon outdoors. After a full day exploring, stop by Takoda’s Restaurant in nearby Rainbow to savor freshly baked pizzas or the restaurant’s famous mac ‘n’ cheese. The McKenzie River Valley is a year-round recreation destination, and a centerpiece for many is the McKenzie River National Recreation Trail. The trail is 26 miles long and about half that distance is below the snow line, so you have good opportunities for hiking and biking anytime. If you’re looking for a campsite to call your own, that’s no problem — there are 14 US Forest Service Campgrounds along the McKenzie River. 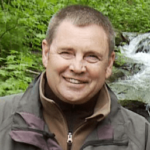 One of my favorites is Delta Campground (open April 18 to October 19) because it boasts a marvelous hiking trail through an ancient forest stand, with scores of gigantic Douglas fir trees that date back more than 500 years.